In the Enclave, scars set you apart, and the newly born will change the future. In the future, in a world baked dry by the harsh sun, there are those who live inside the walled Enclave and those, like sixteen-year-old Gaia Stone, who live outside. Following in her mother's footsteps Gaia has become a midwife, delivering babies in the world outside the wall and handing a quota over to be 'advanced' into the privileged society of the Enclave. Gaia has always believed this is her duty, until the night her mother and father are arrested by the very people they so loyally serve. Now Gaia is forced to question everything she has been taught, but her choice is simple: enter the world of the Enclave to rescue her parents, or die trying. A stunning adventure brought to life by a memorable heroine, this dystopian debut will have readers racing all the way to the dramatic finish. Gaia is now a servant of the Enclave, delivering newborn children and following in her mother's footsteps. But what starts as a joyous occasion, her first unassisted delivery, turns into a night of terror and interrogation after her parents are arrested and taken. Only told to carry the role of midwife on and serve the Enclave, Gaia must deliver the first three newborns each month to the inner gated city, the children approved for advancement and the mother compensated, with the traditional birthmark tattoo to each chosen baby as taught by her mother. Gaia is still yet to hear word of her parents, her only reminder of their fate being the book and ribbon left to her before her parents were captured. She needs access to the Enclave, but with the scar on the side of her face, blending in will be no easy task among the perfect citizens and chosen children within the city's confines. After aid from a citizen outside the walls, Gaia quickly realises that the Enclave isn't the perfectly groomed city those in the outer can only yearn for. But when attempting to stop a public hanging of a pregnant citizen captures the guards attention, Gaia once again finds herself being interrogated by the seemingly cold, young Sergeant Leon Grey and a group of imprisoned doctors, forced to serve. As Gaia studies the ribbon her mother left in her possession, she sees the intricate symbols and patterns, but cannot decipher the code. The Enclave have accused her mother of keeping illegal records of each child she has delivered and forced to hand over the wall, and supposedly Gaia knows where they can be found. But when word filters through that her parents are to be executed, Gaia has no option but to cooperate with the authorities, and Sergeant Grey, who seems to see past Gaia's scars and finds himself wanting to protect her. Stuck in the holding cell within the Enclave, Gaia needs to escape and free her parents, but everything comes at a price. Finding herself as an assistant midwife, Gaia is able to leave the confines to assist one of the several doctors being held at the Enclave's disposal. Relying on the fickle generosity of Leon Grey and Sargent Bartlett, Gaia escapes and flees to the only person within the walls that can help. She never imagined that Leon would be behind her, leaving against his father's wishes to protect the girl that is a class all of her own. He and Gaia devise a plan to rescue her mother, but they didn't plan in her mother being in such a fragile condition, making a hasty retreat almost impossible. Gaia has no choice and flees the palace and the Enclave behind. With the precious bundle and ledgers that she'll be hunted for, but when Leon sacrifices his life and everything he has been taught to believe in for Gaia, she needs to be safe and leave. Leave the only home she's ever known, her sector and the life that will never be the same, and searches for the Dead Forest. A new chance at life, to honor the birthmarked children that are so cruelly ripped from their parents, and the person that now depends on her most. 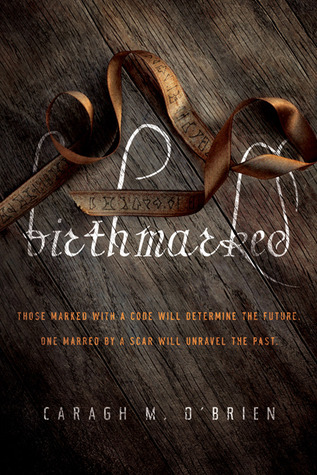 Birthmarked is the story of Gaia, who lives within a society that is rebuilding under the watchful eye of the Protectorat, who rules with an iron fist. She lives in the sector slums, due to being scarred as a child, when only the perfect children are taken to live within the prestigious walls of the Enclave. Growing up with only one friend, her parents are both loving and doting on the child that they were allowed to keep, having previously been forced to give two boys to the advanced society. Gaia is training as a midwife, having achieved her first unassisted delivery when she arrives home to find her parents missing... And her fight begins. Fans of heavy dystopian novels will thoroughly enjoy the Birthmarked series, Gaia isn't an instant heroine, but it's afraid to stand for what she believes in. She isn't the perfect, doe eyed beauty that we find in so many young adult books of the same genre, but she's likeable, she's emotional and she's tough. There isn't instant love between Gaia and Leon, but a genuine attraction to one another. It's isn't quite suitable for some young teens, as the birthing scenes are a touch too graphic. Really enjoyed it and will be continuing with the series. Sounds good. Love the review.